“Martin was persuaded to try Kronborg’s roast pork. 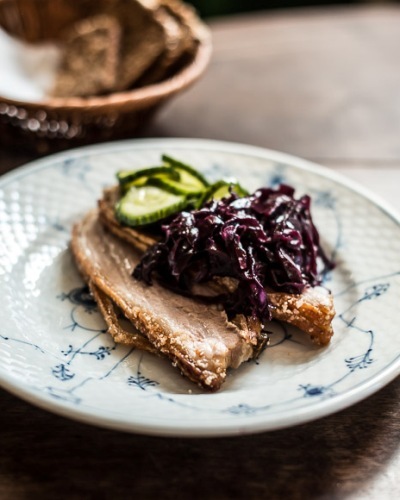 Two large slices of freshly roasted pork with crisp crackling, home-made pickled red cabbage and ditto pickled cucumber. I tasted it and it was no less than perfect,” writes food blogger, Mette Juulsgaard, from Becauseitmatters.dk about her lunch at Restaurant Kronborg. 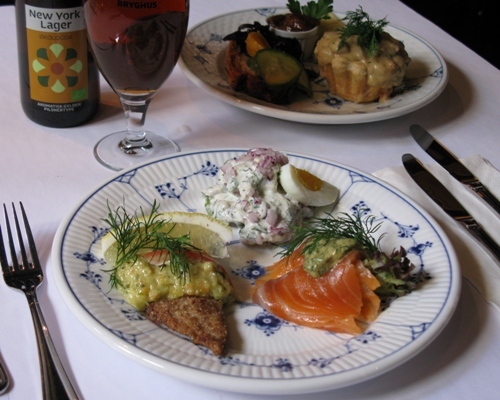 ”I would bring guests to Kronborg anytime, to experience Danish ”smørrebrød”, great beer and classic service of the good, old school, kind,” writes food blogger, Mette Juulsgaard, on her popular blog, Becauseitmatters.dk. 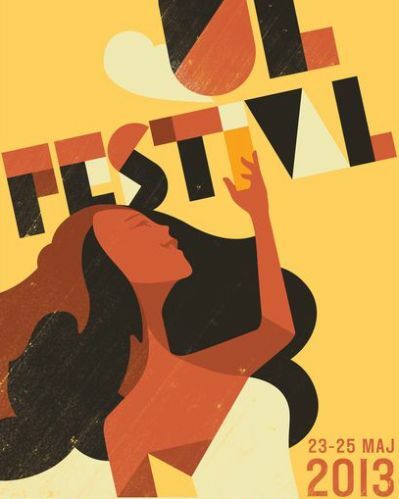 Sample some of the best beers in Denmark at Copenhagen Beer Festival 2013 at Tap 1 on 23-25 May 2013. “You really get a sense of what Danish culinary excellence is all about,” writes Amy Strada in this week’s edition of The Copenhagen Post, as she reviews our “Open-faced sandwiches with a twist and choice artisan beers”-menu for the food festival, Copenhagen Cooking – winter edition. 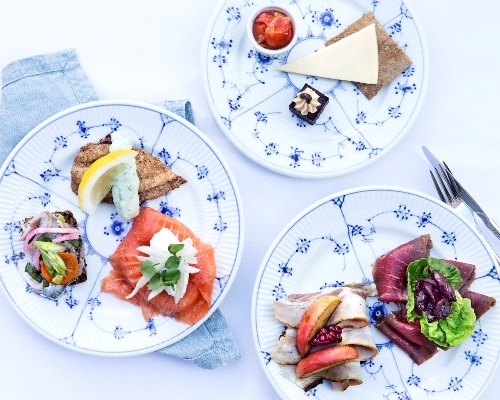 “A twist that will turn heads,” writes Amy Strada in this week’s edition of The Copenhagen Post, as she reviews our Copenhagen Cooking-event, “Open-faced sandwiches with a twist and choice artisan beers”. Amy Strada likes the twisted, traditional Danish lunch, complete with artisan beers from local brewery Nørrebro Bryghus. Read the rest of Amy Strada’s review online or in the web-version of this week’s The Copenhagen Post. Or book a table for your own lunch with a twist at Restaurant Kronborg. Please note that the menu is part of the food festival, Copenhagen Cooking – winter edition, and is only available till Thursday 28 February 2013 (unless otherwise arranged). The popular food magazine Gastro draw lots about two of our ‘twisted lunch platters’ with beer menus from Nørrebro Bryghus. 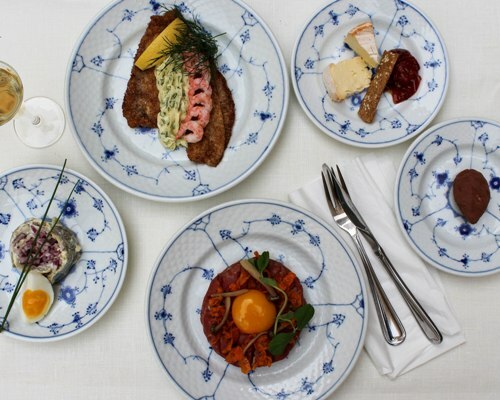 We twist our traditional Danish lunch platters to celebrate the food festival, Copenhagen Cooking 2012. We draw lots about two ’twisted lunch platters’ with beer menus from Nørrebro Bryghus in collaboration with the popular food magazine, Gastro. We twist the traditional Danish lunch platter with herring, salmon, duck breast, cheese and a temptation for the sweet tooth to celebrate the food festival, Copenhagen Cooking 2012. Beer Ambassador Kasper Larsen from the local gourmet brewery, Nørrebro Bryghus, has kindly composed a special beer menu for the delicacies. The food festival, Copenhagen Cooking, takes place from 24 August to 2 September, and the deadline for participating in the competition is 20 August. 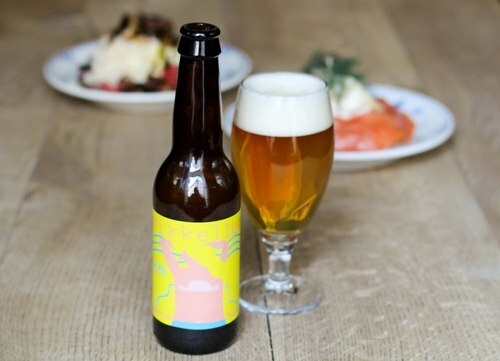 We invite you to read more about our ’twisted lunch platter’ and the beer menu from Nørrebro Bryghus and to participate in the competition at Gastro.dk (sorry in Danish, only). Or go straight to the source and book a table for lunch at Restaurant Kronborg. Jacobsen’s popular Saaz Blonde is now available on draft. Saaz Blonde is the perfect companion to fatty fish, like rimmed salmon or smoked Greenland halibut. The brew master at Carlsberg’s gourmet brewery, Jacobsen, listens to his followers and now launches popular Saaz Blonde on draft. and added a bit of elegant Czech Saaz hops, thus the name Saaz Blonde. generally prefer wine with their food. Jacobsen recommends Saaz Blonde for starters, fatty fish, cheese and dessert. 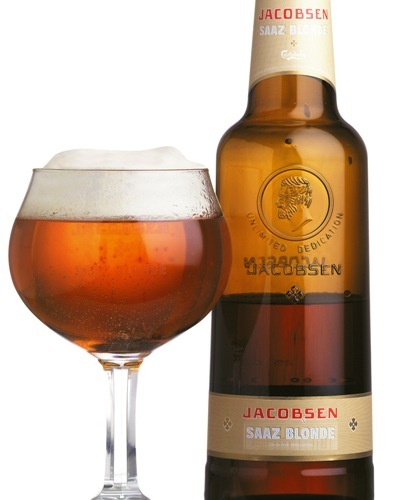 Find more information about Jacobsen Saaz Blonde (sorry, in Danish only). 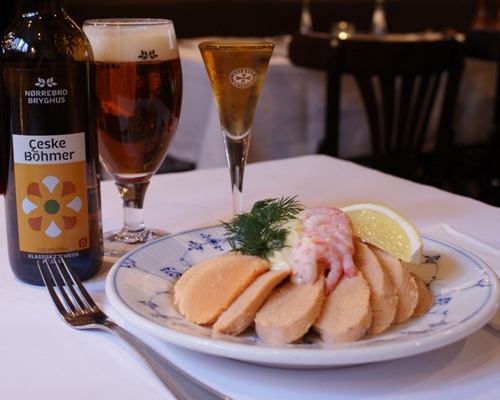 Or enjoy it with rimmed salmon or pan-fried plaice at Restaurant Kronborg. 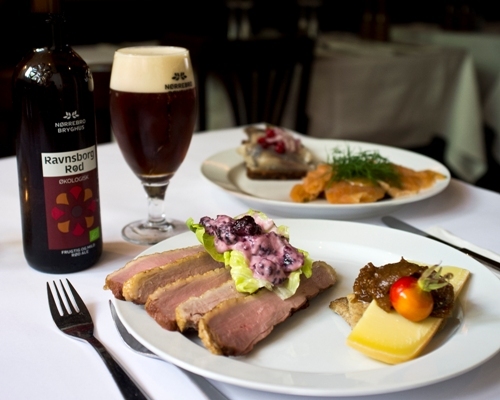 Jacobsen’s popular Christmas Ale – Jacobsen Golden Naked Christmas Ale – is the perfect companion to the succulent Nordic Christmas food, like duck, roast pork and open-faced sandwiches. The name is hard on the tongue of the Danes: Jacobsen Golden Naked Christmas Ale. But the taste has convinced the sceptics and Jacobsen’s Christmas ale has quickly become one of our most popular beers on draft. Jacobsen Golden Naked Christmas Ale gets its name from the so-called ’naked oats’, where the oats are quite loose and often fall of during the harvesting. The naked oats makes the ale extraordinarily creamy and smooth. The brewer adds huge amounts of freshly grated orange peels, cinnamon and fennel seeds, and you achieve an amazing companion to the succulent Nordic Christmas food, like duck, roast pork and open-faced sandwiches. 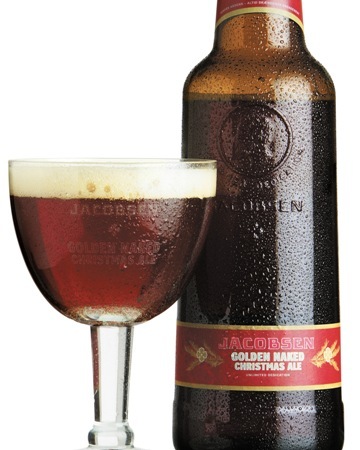 Find more information about Jacobsen Golden Naked Christmas Ale (sorry, in Danish only). Or enjoy it with your Christmas Feast at Restaurant Kronborg.